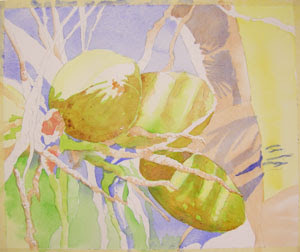 Now it's time to build some of the beautiful colors in the coconuts! Using Burnt Sienna in a very wet mixture, I glazed a wet wash onto some areas of the coconuts where I wanted them to look warm and a bit darker. Some of the edges are crisp (painted on dry paper). Some of the edges have been softened with a clean, damp brush. I used a stronger wash of the same color on the lower coconut. The value needs to be darker, and therefore the stronger color (less water).